Commingled Recycling Policies: Can the introduction of Single Stream recycling co-exist with the New York State Bottle Bill and the operation of New York City's Redemption Centers? New York City's waste management system is a diverse assembly of public and private partnerships that have continually amended its waste management policies throughout the years. The Bottle Bill of 1982 and Single-Stream proposal of 2020 are examples of policies intended to improve municipal recycling and minimize the need for disposing waste by landfill. The New York State Bottle Bill (NYSBB) diverts waste form landfills by allowing consumers to redeem a five-cent deposit for every empty beverage container they recycle at specific retailers or designated redemption centers. The New York City Department of Sanitation (DSNY) single-stream recycling system intends to replace the current dual-stream recycling system in order to address an array of recently proposed city initiatives such as zero waste to landfill by the year 2030. 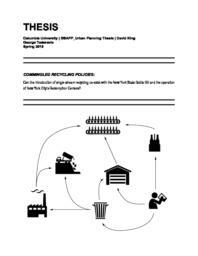 Of the many environmental initiatives proposed in Mayor De Blasio's OneNYC plan, this report focuses on pollution and environmental justice by analyzing the vehicle miles traveled (VMT) associated with the following three recycling systems: the New York State Bottle Bill, DSNY's current Dual-Stream system and DSNY's proposed Single-Stream system. A combination of open source data, network analyses, field research, and interviews, were synthesized in order to quantify the VMT produced by each of the three recycling streams analyzed. Field research and data acquisition revealed that, although the NYSBB had annual data at the regional level, it currently lacks the granular information needed to accurately compare recycling at the municipal level. At the same time, interviews with New York City policy makers and environmental justice advocates revealed health and safety hazards at the district level that are currently overlooked at the municipal level. Ultimately, this report reveals that the elimination of redemption centers in New York City would increase VMT for DSNY's municipal recycling collection yet acknowledges the need to expand the NYSBB's currently weak regulations in order to comply with New York City's environmental goals. Creating synergy between state and municipal recycling policies will allow New York City to achieve the legislative agendas of OneNYC, improve environmental equity for burdened communities and increase incentives for recycling.